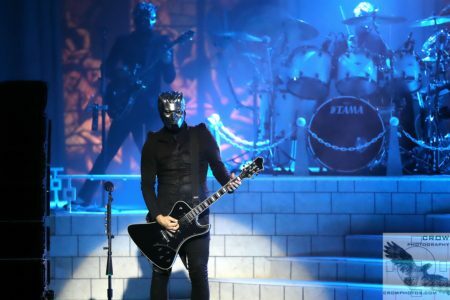 Ghost provided an intense evening at the theater for San Diego rock fans, performing at the historic Spreckels Theatre in downtown San Diego, California on November 11, 2018. The sold-out show was a tour de force, leaving fans exhilarated, exhausted and inspired. The Grammy-winning Swedish rock/pop band is led by creative powerhouse Tobias Forge, who has been referred to as “the Andrew Lloyd Webber of rock.” He is Ghost’s creative force, singer, songwriter, musician, and architect of the elaborate storylines that are woven throughout the band’s four full-length studio albums, EPs, music videos, webisodes, and live shows. Ghost is well-known for its theatrical stage shows – they also just announced a 2019 tour with Metallica in Europe. A Ghost show is presented in two acts with an intermission, similar to a play. 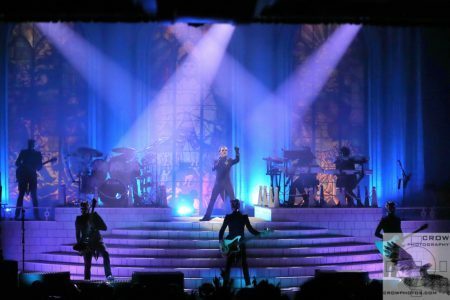 For the current “A Pale Tour Named Death Tour,” frontman Cardinal Copia (Forge’s character) and the now expanded band featuring seven Ghouls and Ghoulettes present an almost three-hour program on a striking stage set, performing some of the band’s most popular songs from Ghost’s catalogue including selections from the band’s new album Prequelle like “Dance Macabre,” the band’s brand new single, and “Rats,” the song that held the #1 position on the Active and Mainstream Rock Radio charts for nine weeks, becoming the longest-running track to top those charts this year. Prequelle is loosely based on The Black Plague of 14th century Europe, a metaphor Forge hopes will apply to the societal ills of today. It is a rare treat to experience a high quality band in such an intimate setting. Any chance you get to see a rock show in a theatre, with perfect acoustics and historic ambience, you should jump at it. Tour dates are available at http://ghost-official.com/home/#tour. Tagged Ghost, San Diego, Spreckels Theatre.